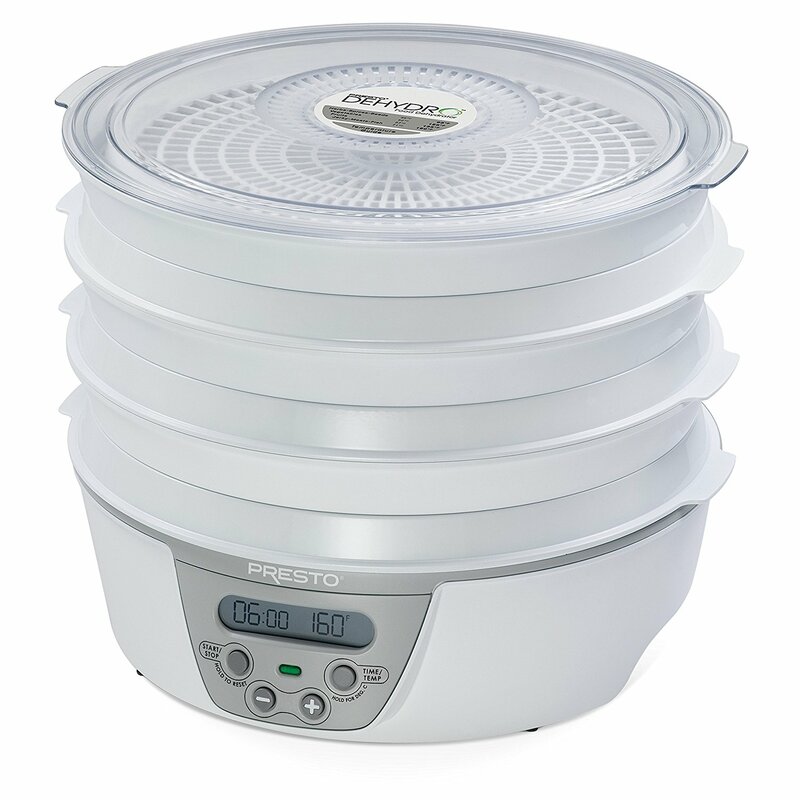 The Presto 06301 Dehydro digital electric food dehydrator is a tiny machine packing a mighty punch. It has high ratings and a low price, which is sort of the best case scenario for at-home products. 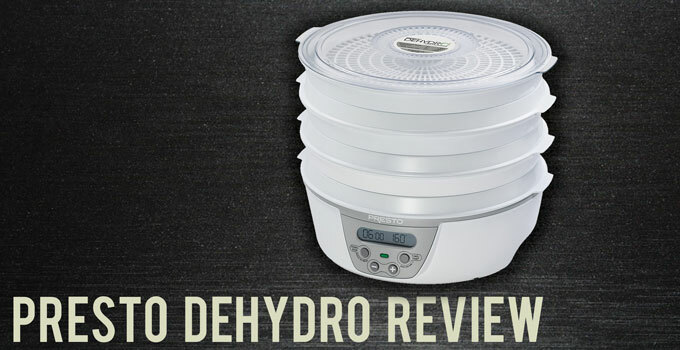 What most users seem to hone in on with this dehydrator is its ease of use. To be more specific, the machine is small, shrinkable and expandable, dishwasher safe, and digitally operated. Its attributes make it suitable for people who want to simplify their dehydrating experience without missing out on high caliber food. The Presto 06301 Dehydro has a great average of 4.4 out of 5 stars among Amazon reviewers. The primary praise for this dehydrator is that it is easy to use. The compact size, digital operation, and adjustable shelves make dehydrating with this machine a pleasant experience. The vast majority of customers claim that using this dehydrator results in tasty food. A few negative reviews say that it takes longer than recipes say it should. This could be possible considering its small size but not likely due to its compensatory 750-watt heating power. What Does the Presto 06301 Dehydro Come With? The standard Presto 06301 Dehydro comes with six circular drying trays, but six more trays can be stacked onto the machine for a total of 12. Each drying tray is fully immersible and dishwasher safe. This leaves you with less time spent cleaning and all the more for dehydrating. A see-through top cover also allows you to monitor the top layer of food while its at work. This way you can make sure no food is out of place and also know when it is all ready to be taken out. Facilitating this process is the built-in timer. It can keep tabs on the process for a ridiculous 48 hours at a time. This extended timer is great for deep dehydration. For example, dense slabs of meat need to be cooked for a longer amount of time at a slightly lower temperature. In addition to these features, this product comes with two fruit roll sheets, two mesh screens, and sample packets of jerky spice and cure that are great tools to get you started and help your work run smoothly. When dehydrating a lot of meat, for example, you can place one of the fruit roll sheets on an otherwise empty bottom rack to collect grease and prevent it from dripping into the bottom or out of the machine. Another environment-friendly upside to this device is that all of the drying trays, the cover, and the unit itself are BPA-free as of 2015. It’s not the size of the dog in the fight, but the size of the fight in the dog is a fitting expression when describing the drying power of this dehydrator. Despite its small size, the Presto 06301 Dehydro runs on 750 watts of power. This is 150 watts higher than the typical 600 watts that charge most medium-sized dehydrators larger than this one. The heating unit provides constant airflow via a fan that is mounted to the bottom. The consistency of the airflow means that there is no need to rotate the drying shelves during cooking. This is crucial to prevent overcooking food inside of a dehydrator this small with that much heating power. Drying temperatures for the heating unit range from 90ºF to 165ºF, which basically covers all the requisite temperatures for effectively dehydrating food. This means you can dehydrate most foods inside this machine even with its smaller size. How Large is the Presto 06301 Dehydro? Weighing a mere 8.5 pounds and sized at 14.5 by 15 by 7.2 inches, this dehydrator is almost small enough to be considered a miniature dehydrator. This is mostly good news; the device can fit on practically any countertop, it can easily be moved, and it can easily be stored. Moreover, individual drying trays can actually be removed from the stack to give you up to 40% additional storage space. These conditions are excellent for people who only plan on dehydrating every so often, and not tons of food when they do so. And this leads to one of the few potential issues with this dehydrator: it might be too small to dehydrate a few wider foods, such as a very thick slab of frozen meat. To be fair, food dehydration is generally geared for small pieces of food, so dehydrating massive chunks of meat is probably not the best idea anyway. A huge perk of this smaller machine is that it is not as noisy as most commercial food dehydrators, although it is in no way whisper quiet. The positives of this are that it can be left on overnight without bugging you too much when you are sleeping as well as during the day when you need to take care of things around the house. As far as convenience goes, the digital control (thermostat and timer) make using this dehydrator a cinch. You can set precise temperatures and timing with no more work than a few clicks of a button. To be sure, the Presto 06301 Dehydro is a little dynamo. It is conveniently small unlike many dehydrators. It also has a potent heating system for its size. Its 750 watts actually beats out the drying strength of most dehydrators that are slightly more expensive and larger. There are a few potential downsides to going with this machine, most of which depend on customer preference. First, its parts are made in China, so people who prefer local manufacturers may need to reconsider their options. Second, its smaller size limits the thickness and quantity of food that can dehydrated. Turn to a different dehydrator if you plan on drying tons of food in a short period of time. With those points being made, this dehydrator is arguably the top choice for those who are looking for something that easily blends in with the rest of their kitchen appliances and still churns out an excellent and tasty product.